Autism in Paradise: Anthrax--now it's for kids!! 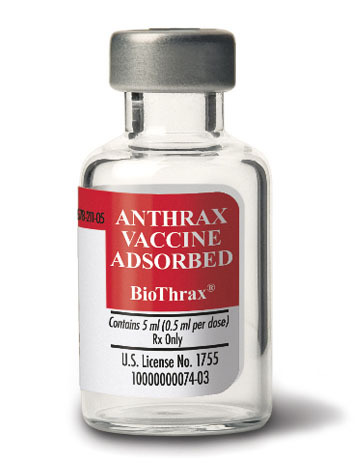 Last October, Sebelius asked the Presidential Commission for the Study of Bioethical Issues to discuss whether or not the anthrax vaccine –and other vaccines that might be used in a bioterror attack—should be tested on children. That hearing was conducted on May 17, and concluded with the Commission deciding that testing on children would only occur if ethical issues can be agreed upon. Its recommendations are expected by the end of this year. This is the same vaccine that ignited so much controversy with military vets who claim it caused what has been termed Gulf War Syndrome, a multi-system, enduring chronic illness whose symptoms include: fatigue; skin disorders; headaches; muscle pain; joint pain; neurologic symptoms; neuropsychological symptoms; symptoms involving the respiratory system; sleep disturbances; gastrointestinal symptoms; cardiovascular symptoms; and abnormal weight loss. Just coincidence you say? These otherwise healthy fellows just fell ill quite by chance? Well, a study conducted for the Centers for Disease Control in Atlanta found that the adjuvant used in the anthrax vaccines, Aluminum Hydroxide, induced motor neuron death in mice. (http://www.ncbi.nlm.nih.gov/pubmed/17114826) “The findings suggest a possible role for the aluminum adjuvant in some neurological features associated with Gulf War Illness and possibly an additional role for the combination of adjuvants.” (squalene was also used). Gee, isn’t that comforting—it’s in all the common vaccines. I don’t like to get into the vaccine debate because it is so polarizing, but it is alarming to me that a study published on a U.S. government website states Aluminum Hydroxide can potentially induce neuron motor death, and yet it’s still an additive to vaccines that we require our military members to get, and now are proposing to try out on our nation’s children—all for a hypothetical threat that might never materialize. I don’t know about you, but I think my kids will pass.